Heat oven to 450°F. Line 15x10x1-inch pan with foil; spray with cooking spray. Place fish fillets in pan. In small bowl, stir mayonnaise, lemon peel and pepper until blended. Spread over top of each fillet. In small bowl, mix bread crumbs and Parmesan cheese. Spoon evenly over mayonnaise mixture; pat crumb mixture lightly into mayonnaise. Bake 12 to 15 minutes or until fish flakes easily with fork. Serve with lemon wedges. Fish is a lean protein source that supplies amino acids that give structure to the body in skin, cell membranes and muscles. Substitute salmon for the haddock and reap the benefits of heart-healthy omega-3 fats. 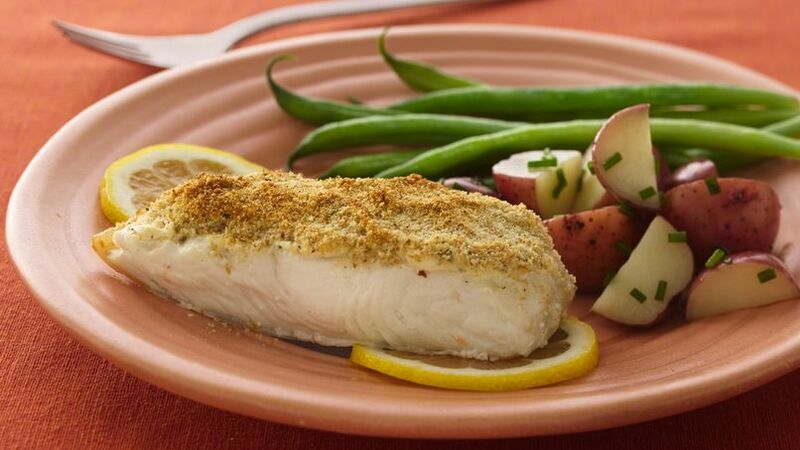 This quick-to-assemble baked fish is loaded with flavor and the topping keeps the fish moist.